This trip is an adventure for the whole family and includes boat rides, bicycling, kayaking, elephant riding as well as visits to temples. Learn about the customs and the traditions of Laos. Visit the markets and show the children how the people of Laos shop and what foods they eat. Hiking is made easy at a slower pace. Children will enjoy an elephant ride sitting high atop this wondrous animal. The Traditional Arts and Ethnology Center also offers children activities. 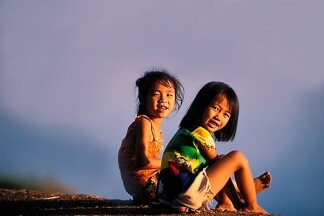 Laos Family Adventure is an unforgettable family vacation you will be talking about for years to come. After breakfast, board a tuk-tuk to visit Vientiane’s main attractions. Start at Wat Sisaket, which is the only temple left intact after the Siamese invasion of 1828. See thousands of Buddha statues lined up before visiting Wat Phra Keo, a temple and religious museum that displays a collection of art representing Lao and Khmer artefacts. Drive to the Buddha Park, located an hour away of Vientiane. There is space for the children to roam around and explore the sculpture garden which is full of Buddhist images that appear to be centuries old. Drive to Vang Vieng, a small idyllic riverside town surrounded by beautiful limestone karst formations. En route stop to visit a local minority village where the Hmong tribal people live and visit their local market to learn more about their customs. Continue to the Ngum reservoir where a picnic lunch is served by the lake. You can take a boat ride on the lake. Upon your return to Vang Vieng you can rent bicycles in town. After breakfast, drive through the countryside of Laos. Cross one of the few bamboo bridges over the Song River and start exploring the picturesque countryside and caves on the other side. Feed the fish or swim in the Blue Lagoon at the foot of the Tham Phu Kham cave. Return to Vang Vieng for lunch and then start a kayaking adventure on the Song River. Your guide will provide you with a safety briefing and some basic instructions on how to kayak. Drive to Luang Prabang via Phou Khoun. You can buy some fresh fruits and snacks here. As you approach Luang Prabang, the scenery becomes more mountainous. It is a scenic drive and you will be able to stop several times on the way for photos. Arrive in Luang Prabang in the afternoon and enjoy the rest of your day at leisure. Visit the Kuang Si waterfall. Stop en route at Phosy market where you can observe the local vegetable market. Take a leisurely hike through the national park towards the waterfall. Return to Luang Prabang where you will visit the Traditional Arts and Ethnology Center. The center has prepared activities for the children while you can enjoy a tour around it. In the morning, enjoy a game of petanque. This typical French game was brought to Laos during the French colonial time and is still popular among the citizens of Laos. After the game, depart for the Tad Sae waterfall. This afternoon you can get up close with some of nature’s biggest and most friendly creatures, elephants. Trek through the jungle on the back of an elephant.